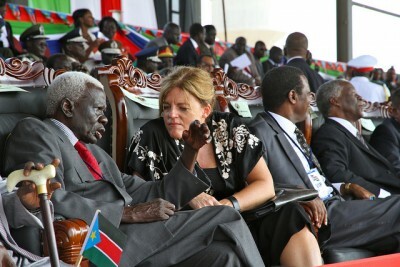 Hilde Frafjord Johnson, a former Norwegian politician, was all smiles three years ago when South Sudan declared its independence in the summer of 2011. Now, three years later, the smiles are long gone and the UN’s leader of peacekeeping efforts is calling it quits as the country continues to decline into violent conflict and famine. Instead, Johnson said, the “negative campaign” has abated, the conflict level has declined and “cooperation is back on a better track.” The new mandate for the UN’s Mission in South Sudan (UNMISS) involves what Johnson calls a “restructuring of the whole operation.” That means, in her opinion, “a new mandate, and a new chief.” She planned to leave when her contract ran out and now it’s simply time to go. 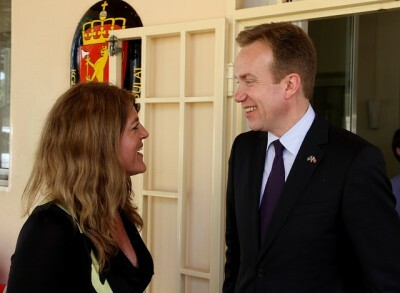 Norway, and Johnson herself, was heavily involved in the process that led to the end of years of civil war in Sudan that cost at least 2 million lives. The peace pact that was agreed in 2005 called for a referendum on independence for South Sudan, in which 99 percent of the population in the south vote in favour. The country became the world’s newest on July 9, 2011, the UN committed to the peacekeeping operation and Johnson was named to run it. It didn’t take long for new conflicts to break out between Sudan and South Sudan and among the nearly 9 million people living in South Sudan who are split among several different ethnic groups. The two men leading South Sudan started quarreling, too, with President Salva Kiir firing vice president Riek Machar after a long power struggle. They mobilized their respective ethnic groups, which in turn led to horrific violence that’s left thousands dead and an estimated 1.5 million forced from their homes. A ceasefire was finally hammered out and an August 10 deadline looms for a new transitional government to be formed. Less than two months after Norway hosted a major pledging conference for South Sudan, Johnson remains deeply worried, claiming that the timeframe “is very short” to save the country from imploding. “There’s danger of a massive famine and that war can break out again,” she said. EU Commissioner Kristalina Georgieva also warns of more political chaos and an enormous humanitarian catastrophe, conceding that the world’s expectations for South Sudan were way too high. “We wanted so badly for things to go well for the people of South Sudan,” she told Dagsavisen. “In fact, we were hoping that the ethnic conflicts that had developed over several hundred years would disappear in the space of a few years.” That proved unrealistic.